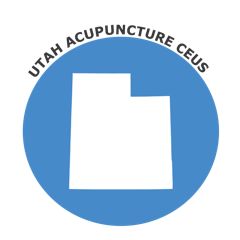 ACE is proud to offer Acupuncture CEU/PDA courses for Utah Acupuncturists seeking to renew their license. Stay on top of your Acupuncture CE requirements and further your professional skills with ACE. Choose from a variety of different online courses pertaining to Acupuncture, TCM/Oriental Medicine, Herbs, Ethics, and Bio-Medicine subjects. We strive to make obtaining acupuncture CE online a seamless process, which is why you receive your certificate of completion immediately after passing the course. The state of Utah accepts NCCAOM approved courses for acupuncture license renewal. Please visit the NCCAOM PDA or CEU page for current course listings. To become a licensed acupuncturist, the state of Utah requires a passing score as determined by the NCCAOM on all examinations for certification by NCCAOM. A licensee must complete 30 continuing education units (CEU) within the two-year renewal period. Meeting the same professional development requirements as those licensed under this chapter. The division shall notify each licensee in accordance with procedures established by rule that the licensee’s license is due for renewal. If the division does not receive the application for renewal, renewal fee, and needed documentation showing completion or compliance with renewal qualifications by the license expiration date, then the license will not be renewed. The state of Utah considers the below list to be Unprofessional Conduct. Please review all points below to stay current on your states laws and rules pertaining to the practice of acupuncture. (6) administering venous injections, immunizations, legend drugs and controlled substances. For additional information and details, please visit the Utah Acupuncture Board’s website.